There was a time when Low PPM Colloidal Silver was so overpriced that it made sense to make your own. There is NO need to buy expensive Colloidal Silver Generator Do It Yourself Kits Anymore! Depending on the PPM you purchase, you can make HUNDREDS of Bottles of Lesser PPM in just hours! 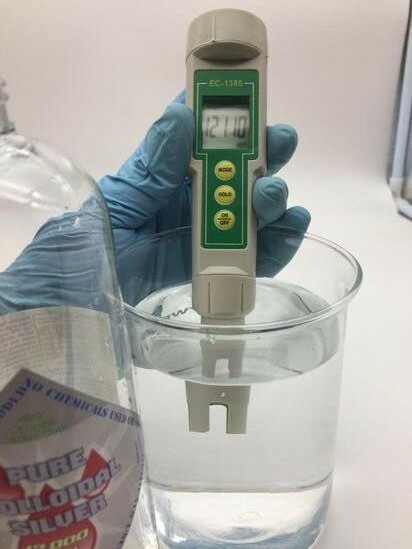 If a Low PPM colloidal silver generator takes 2 hours to make 12 ounces of 10 PPM, it will take about three to four weeks to make 7 Gallons, with just one generator, with the risk that it possible that your solution may turn light gray to black. Gallons! You could do it in a few hours and not weeks. 1. You would never have to buy an expensive colloidal silver generator. 2. You would never have to worry about your colloidal silver generator not working. 3. You would never have to buy expensive silver electrodes. 4. You would not have to risk getting electrocuted in the process. 5. You would never have to spend hours just to make 12 ounces of Low PPM nanoparticle "chemical goo." 6. You could make so much that you could even have enough stored away in case of an emergency. • Babies and Toddlers that need TLC. • Some people are more sensitive than others, and Low PPM may work for them. • Some people may want to dilute to resell the products as do other distributors. One of our distributors in Europe has done Efficacy Tests and determined that 200 PPM is the bare minimum for rapid effectiveness into most common issues. While 300 PPM was sufficient when applied to various types of Hepatitis. But the higher the PPM, the more potent, and the more micro bullets are made available to rapidly deal with stubborn bugs. We do not recommend Diluting to anything under 1000 PPM because for every 1000 PPM atomic particles will convert to 25 mcg/PPM for example 4000 PPM will convert to 100 mcg/PPM of Silver Nanoparticles. After you consider the above calculations and facts, you can conclude on your own, why the nano-particle colloidal silver generator (as well as Ionic) Industry vehemently oppose our High PPM Atomic Particle Colloidal Products and distort the truth to persuade you to buy their Low PPM products. They have used scare tactics for 11 Years! We are still here growing faster than ever! Absolutely, the Highest PPM anywhere! After all, isn't that what you are looking for? Another way that others have made 10 PPM nanoparticle colloidal silver is with a Neon Transformer. We do not recommend this method since it requires super high voltage, but is very easy to do. What others do is attach silver wires to each of the power leads on the neon transformer. They then place them under the water about 1/16 to 1/8 inches apart, then they add some salt or hydrogen peroxide, turn it on, and it starts to produce nanoparticle colloidal silver. Again, nanoparticle colloidal silver is the reason why a few people have contracted Argyria; the particles are too large, they can get stuck in the skin cell membranes, the kidneys, and liver. On top of that, once you consume the huge nanoparticles, the stomach acids create combine with the Heavy Silver Metal particles, and as it breaks down the silver, it creates Silver Chlorides or hydroxides, that is the reason that people got Argyria . Better to be safe than sorry, we have eliminated the risks associated with nanoparticle colloidal silver, by creating High PPM Atomic Particle Colloidal Silver that you can dilute or use as is.